Preheat oven to 425F, with both racks in the centre of the oven. Spread out this mixture on a very large baking sheet, in one layer. Place both pans into the preheated oven, with the tomatoes on the bottom rack, and the vegetables on the top rack. Bake for 20 minutes. Remove pans from oven, and give each a stir, trying to flip the vegetables to brown the other side. Put back in oven for 10 minutes, or until golden, and the tomatoes are bursting and juicy. * If you are serving over pasta, reserve about 1 cup of the cooking water. First, toss the tomatoes and some cooking water together with the pasta, so that the tomatoes and their liquid coat the pasta. * If serving over grains, just toss the tomatoes and their juices with the grains. Put the tomatoes and pasta or grains into a serving bowl and top with the contents of the vegetable pan. ** If you are using dried herbs, toss them with the tomatoes and vegetables at the same time as the olive oil and balsamic vinegar. For an exact recipe, which I have adapted, go to Cookie & Kate. 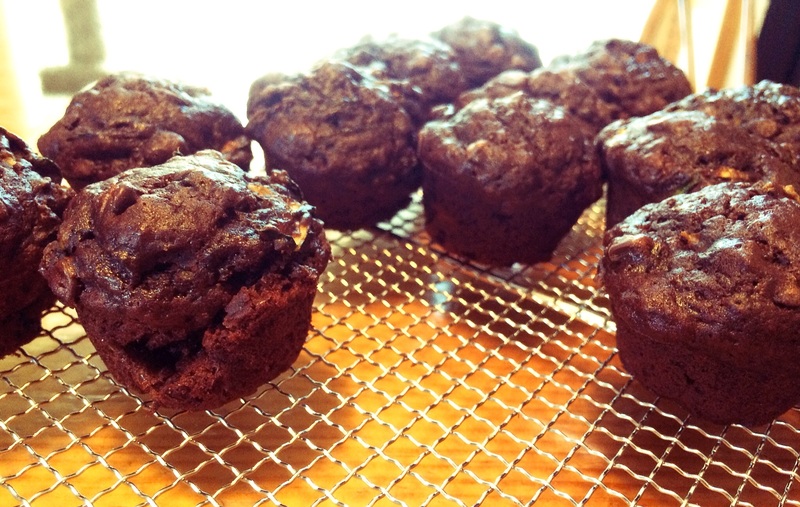 Chocolate, banana, and zucchini muffins. Preheat oven to 350F. Grease muffin tin with butter or spray; set aside. In a medium mixing bowl, whisk together cocoa, flour, baking soda, baking powder, salt and cinnamon. In a large mixing bowl, combine oil, vanilla, and both sugars. Stir in eggs, bananas, and shredded zucchini. Fold dry ingredient mixture into wet ingredient mixture, just until combined. Gently fold in the chocolate chips. Scoop batter into prepared muffin tin and bake in the preheated oven for about 45 – 60 minutes, until a toothpick comes out clean with a few moist crumbs sticking to the toothpick. Cool completely before storing. My zucchini hater likes this. She tells me it’s because the zucchini is in such tiny pieces, not in big chunks, so it’s a texture thing. I suspect that it’s because it has shaved Parmesan cheese scattered on top (she’s been known to go to the fridge to hack chunks off of the block for a snack)! Heat the oil on high in a large skillet or wok. When it is hot but not smoking, add the almonds to the pan. Cook and stir, until the almonds are golden-brown, approximately a minute or two. Add the zucchini to the pan, tossing it with the oil and almonds until it is tender-crisp. This will only take a minute or two! Season with salt and pepper, and toss. Pour into a serving dish, and throw the cheese over top. Serve immediately.